A young child’s love song to Mommy. "When I’m with Mommy, I feel cozy. We have the best time." They do things together. Fun things. Almost magical: "It's raining," says Mommy. "Let’s sing the rain away." The illustration shows Mommy and child out in the rain under a gigantic leafy umbrella! What a fun way to sing the rain away. "I wish I had someone to play with," says the narrator. Mommy invites a friend over. She sees the child grow sad when the friend goes home. Now its Mommy who seeks help. Smart mommy. "Would you help me make supper?" asks Mommy. I set the table. I stir the cheese on the noodles. Soft colors, crisp illustrations. A complete story told in few words and short sentences. The kind that invites participation. 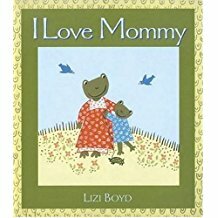 Lizi Boyd knows how to make a perfect read-aloud picture book.